This is the first game in the Danger Mouse series. For other games in the series see the Danger Mouse category. 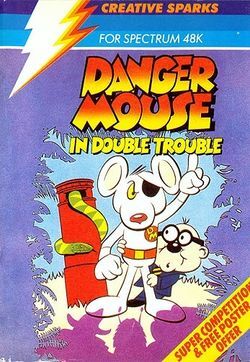 Danger Mouse in Double Trouble is an action game that was originally released by Creative Sparks for the Sinclair ZX Spectrum in 1984 (and designed by Martin Harris and Nick Burroughs); it was later ported to the Commodore 64 in that same year by Martin C. Sexton, and to the Amstrad CPC in 1985 by Phil Snell. It is based on the Cosgrove-Hall/Thames Television animated series of the same name. This is the first game in the Danger Mouse series; it was followed up by two sequels, Danger Mouse in the Black Forest Chateau (also dating from 1984) and Danger Mouse in Making Whoopee (1985). This page was last edited on 8 March 2015, at 11:33.